This year marks the 200th anniversary of Mary Shelley’s thought-provoking novel, Frankenstein or, The Modern Prometheus, so we thought that before the year is out (the novel was actually published in January, 1818), we’d take a look 10 London locations integral to her story. First up, it’s to Somers Town, which lies just to the north of Euston Road, where Mary Wollstonecraft Godwin (later Mary Shelley) was born on 30th August, 1797, the second child of feminist writer Mary Wollstonecraft and journalist, philosopher and novelist William Godwin. Wollstonecraft sadly died 12 days after the birth due to complications. Mary was left in the care of her father and half-sister Fanny Imlay (Wollstonecraft’s first child whose father was an American adventurer named Gilbert Imlay) and, after her father remarried in 1901, a step-mother Mary Jane Clairmont (with whom Mary would have an acrimonious relationship). While Mary was provided with little formal education during her childhood, her father saw that she received a broad education in a range of subjects, generally described as unusually advanced for the time. The family’s home was located at number 29 in the Polygon Building on the north side of Clarendon Square – it was demolished in 1904 and the site is now occupied by a block of council flats called Oakshott Court. 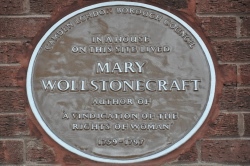 There’s a commemorative plaque to Wollstonecraft on the side of the complex in Werrington Street – it was erected by the Camden London Borough Council (pictured). Mary Shelley, meanwhile, is also commemorated in a mural in Polygon Road which depicts many of the famous figures associated with the area (her parents and future husband Percy Bysshe Shelley are also depicted in it). The mural, the work of Karen Gregory, was commissioned by the Greater London Council in the 1980s.